Hiking the Lake O’Hara Alpine circuit in Yoho National Park should be on every hiker’s bucket list. You’ll be rewarded with sublime scenery from start to finish, turquoise coloured lakes and lichen covered rocks twisted into impossible shapes as well as challenging trails. 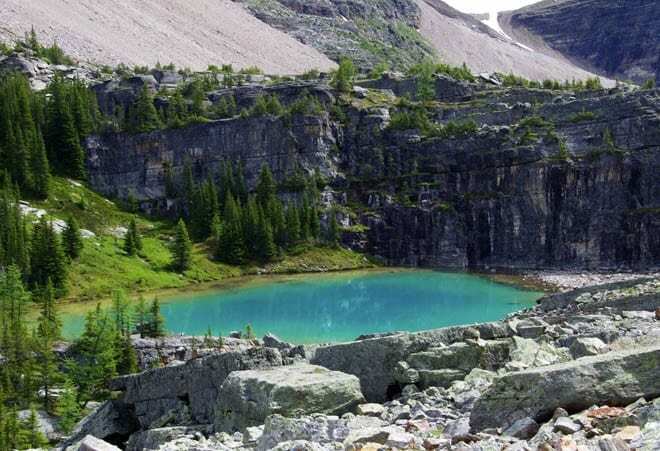 The route was designed by Lawrence Grassi – a man who wore many hats including that of park warden at Lake O’Hara, stonemason, miner and the person whom the Grassi Lakes above Canmore are named for. With great skill, he moved rocks to create a trail that defies imagination. Getting into Lake O’Hara is always an issue. The Lake O’Hara alpine circuit is a loop so it’s easy to eliminate sections. If you hate exposure – ledges, cliffs and paths clinging to the mountains then perhaps you’d want to give the Wiwaxy Gap and Huber Ledges Alpine Route a pass; the same goes for the All Souls Alpine Route. The Yukness Ledges aren’t nearly as difficult or as airy as they appear from afar. You can hike the circuit in any direction. My daughter and I chose to do it in a clockwise direction to get the bulk of the climbing over early in the day. Starting from the Lake O’Hara outlet bridge across from Le Relais day use shelter, hike just a few hundred metres on the trail until you see the sign for Wiwaxy Gap. Veer left and begin a stiff climb of close to 520 metres (1700 feet), at times on narrow ledges. You top out at a saddle – Wiwaxy Gap at 2703 metres (8868 feet). The next two kilometres are challenging and as my daughter said – I hate this, I hate this…we could die if we trip. So watch your footing very carefully. Concentrate, especially early on in the descent from the saddle. Take time to breathe and when you feel secure look around for mountain scenery doesn’t get much better than this. It’s very airy at times but very doable if you don’t have an extreme fear of heights and exposure. Otherwise give it a pass. It took us an hour to descend to Lake Oesa – and the last 20 minutes were much less scary. 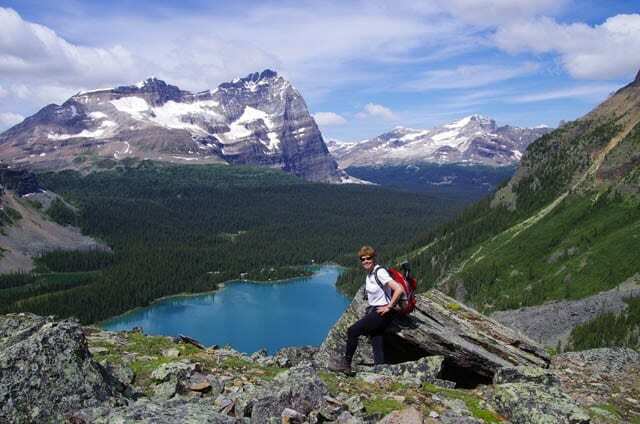 Lake Oesa is breathtaking but it’s popular and busy as there is an easy 3.2 kilometre trail to it from Lake O’Hara. You’ll find slabs of rock, perfect for stretching out on so plan to stop here for lunch. Keep an eye on the aggressive chipmunks as they’ll be in your knapsack or bag of food in seconds. From Lake Oesa look for the sign pointing to the Yukness Ledges route. Descend, cross a small stream, then a boulder section and pass by the small lake in the photo below. In another few minutes reach a signed intersection. Stay left to continue on the alpine circuit or if you’ve had enough you can call it a day and descend to Lake O’Hara from here. The Yukness Ledges are much wider and less airy feeling than the trail up and down from the Wiwaxy Gap. Kids in runners were hiking it with no problem. We chose to descend on the East Opabin trail – steeply at times. In a short 0.8 kilometres you reach Lake O’Hara and from there it’s an easy one kilometre walk to Lake O’Hara Lodge. If you time it right – between 3 PM and 4 PM – you could stop in and have tea and goodies for $10 per person – if there’s space. We hiked a total of 8.8 kilometres (5.5 miles) – not much by my hiking standards but when you have to concentrate on your footing for kilometers at a time it can be slow going. It took us 4.5 hours to hike it plus another ½ hour for lunch at Lake Oesa. You have to reserve a seat on a bus – or pick up a cancellation on the morning you plan to hike. You can make a reservation four months in advance. Most people come in for at least a night – to camp, stay at Lake O’Hara Lodge or at the Elizabeth Parker hut. However it is possible to walk the 11 kilometres up the road and do the hike. We met a couple who had done just that. 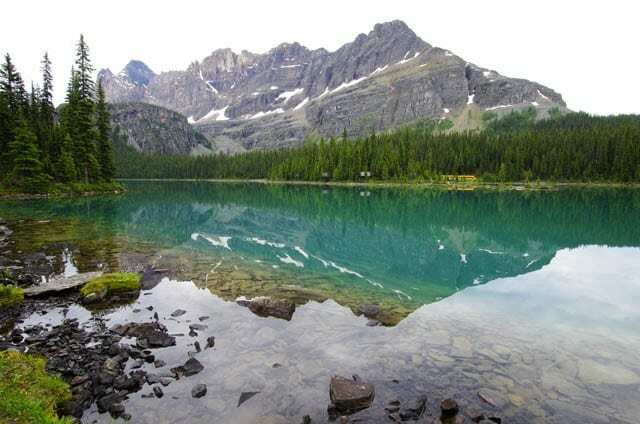 Allow 2 ½ – 3 hours to get to Lake O’Hara and 4 – 6 hours to hike the alpine circuit. Then you can take the bus back down – as reservations aren’t required for that- just a fee. The buses leave at 2:30, 4:30 or 6:30 pm. Make the effort to get to Lake O’Hara. Even if you don’t do the alpine circuit there are enough hikes to keep all levels of hikers happy. We wanted to do this when we were up in the area last week. But we didn’t know about the reservation system until we got there :( Such a beautiful area I can see why it’s so popular that they need to do that. @Jill If you’d had the time and the energy you in theory could have hiked in the 11 kms and taken the bus out later in the afternoon as you don’t need a reservation for it. I know I’m repeating myself, but I really admire you photographic skills and especially the colours. @Mette Thanks for your very nice comment. Beautiful pictures. I have plans on going to Banff, but now you are making me want to do two trips just to try hiking Yoho! @Angela Do it. Go to Yoho and you won’t regret it. The other trail to hike is the Iceline Trail. @Cathy The chipmunks were falling all over themselves trying to get to people. It was a great place to spend time with Kristen – and she ended up loving the sense of accomplishment you get when doing something difficult. Wow the pictures really are stunning. We are visiting Canada next year and have been looking for scenic hikes, I think we just found one! The waters look so blue, can you swim in them? @Kelly You can swim – but you’d have to want to enter glacial waters – so you’d need to be prepared to have your breath taken away. Count on being in for no more than a minute or two – but you would feel refreshed afterwards. And the hike is truly phenomenal. Did you see any other wildlife besides the pesky chipmunks. Look like another beautiful place to hike in British Columbia. @Ted I did see several marmots and a few birds but that was it. We did pass fresh looking bear poop – and scratching in the dirt (claw marks very visible)but didn’t see any bears. Magnificent! Thank you for completing this amazing hike and bringing back such wonderful photos. Yep, those chipmunks sure are aggressive – but cute. I’ll have to build up to being able to handle that hike, but it will be worth it. @Roberta If you’re a lover of Rocky Mountain scenery than I think this is one of the highlights in the whole of the Canadian Rockies. There really are trails for all levels too. Oh my gosh Leigh, you always find such super spectacular hike! Can any get scenic than this? I can’t take my eyes off from the image of those beautiful lakes. And the mountain view is just incredible. Thanks for taking me on a virtual hike; I really enjoyed it. Very lovely photos. @Marisol This is truly one of the best hikes in the Canadian Rockies. Such a pretty spot. I’m due for some good hiking (and I don’t mean in Ohio). @Stephanie The Rockies definitely have the views and the grandeur – and the crowds though the Lake O’Hara area doesn’t get too crowded as the numbers are kept to a minimum. Those photos are absolutely stunning, I love hiking and I so want to go there. I’m definitely going to try to get there next year. @Freya Just remember to book accommodation 4 months ahead of time and a seat on the bus. This has got to be one of the most beautiful looking hikes I have ever seen. It sounds challenging, but looks oh so worth it. I can’t even begin to imagine hiking such an outstanding place. Thanks so much for sharing all the details! Jenn It ranks up there as one of the top hikes in Canada. 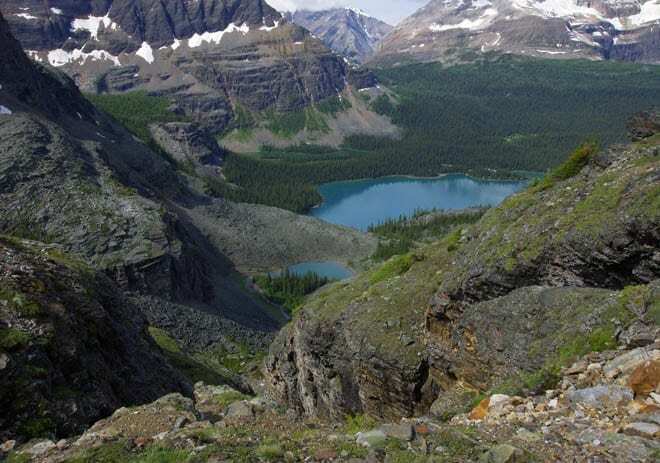 @James Yoho National Park is renowned for its scenery and this is truly a spectacular hike to do. I am very fortunate in that I got to visit Lake O’Hara 3 times. The first time was a few years back on the first day of the season for the bus to run. I hiked the full Alpine Circuit under blue sky, sunshine and very warm temperatures. The second time was the following year on the last day the bus ran for the season. I did most of the Alpine Circuit under very light snow flurries, it was fresh and cool, the ground had a very small amount of snow on it and it was oh so beautiful. The third visit was the best of all. It was mid August a couple of years ago and I got to spend two nights at Elizabeth Parker Hut. I hiked many different trails, and it was a wonderful place to be for sunrise and sunset. I’ve always wanted to do this hike. Your images are fantastic and inspiring. Especially love the one of Lake Oesa. Can’t wait to get out there! @Jody Lake Oesa in the sunshine is remarkable and so beautiful. It’s possible to see it in a day without spending the night if you can get a bus reservation or don’y mind walking in 11 kms to the start point. Sublime views of the Candian Rockies I have yet to visit! Been to Banff with family but this hike you did is one killer for the knees. Awesome! @Dennis It was tough coming down and that’s where poles can help. Fortunately the tough descent – in two places totaled no more than about 90 minutes. 1) How long would it take me to get from Lake Louise to Lake O’Hara? 2) If camping reservations don’t go thru, would I be able to do this as a day hike coming from Lake Louise in the morning? We don’t mind walking 11 Km up the road to begin the hike, but do we need reservations to take the bus back out? Any tips would be great as it’s my first time in this area. Thanks! @Linny Lake Louise Village to Lake O’Hara parking lot is about 20 minutes. Yes you could do it as a day hike – longer but if you’re in shape very doable. You may luck out on a last minute cancellation and get a seat. You DO NOT need a reservation for the bus ride out. Great post. Really enjoyed. Did Huber Ledges to Lake Oesa a couple of years ago and going back this July. Question for you if you don’t mind. This coming trip I am taking my wife with me to Lake O’Hara. I know that the Huber Ledges would be far to scary for her, but what about the Yukness Ledges? From what I have read, it seems like the Yukness Ledges would be less so. No? Could you explain if possible? Thanks!!! Astounding photos in this one, Leigh!! I haven’t done the full alpine circuit yet, but I brought two of my kids up there for one of their first-ever backpacking trips! My brother brought two kids up also – it was great!! @Hank What a fantastic area – truly some of Canada’s best mountain scenery. 1. If we embark on the 10:30am bus, what time would we arrive to Lake O’hara? @Meg & Omer That’s great you got a reservation. You’ll be at the TH by Le Relais in about 25 minutes tops. The trail starts across the street from there and you can buy a map at Le Relais. The loop we did should be on it. These trails are VERY WELL signed. Hi, if we hike up 11Km and not take the bus, are we allowed to camp there? I see an option called wilderness pass, what is this? Can I take this pass, hike up 11km and plan to camp there? @Anish You can’t camp without a reservation – even if you do take the bus. I’m not familiar with the wilderness pass – but I would suggest contacting Yoho National Park for more info. Are three nights/four days too much time to spend there? Are there enough good trails to warrant that length of a stay? @Alan Three days of hiking for sure and four days would be alright if you literally want to hike everything. There is so much beauty you might want to savour the hikes and not go as far every day so from that perspective four days would be great. Thanks for such an informative guide for the alpine loop! I am doing a solo trip and plan on camping near Lake O’Hara and wanted to see if you have any suggestions on where to stay before I do this hike (I’ll be doing this on 3/28). Also if you have any information on the distance between the trailhead and the campsite that would be great too just so I can plan the day ahead of time. I am stoked for this hike! Thanks! @Myung I hope that’s not March you are referring to as the hike isn’t doable until July. There is camping in Yoho National Park. Takkakaw Falls isn’t very far away. Here’s a link to those campgrounds. http://www.pc.gc.ca/eng/pn-np/bc/yoho/activ/camping.aspx. I would think at most the TH would be 30 minutes from the campsite. Field is nearby and there are B&B’s there as well. You have convinced me with your description and amazing photos. I am not good with exposure, but I’m going to give this a try. A good reminder as it is time to make a booking for the bus. Wish me luck on both counts! @Mandy Just keep your circle of fear in a 10′ radius and its all doable. It’s such an exceptional hike and you will feel awesome at the end. I suspect there will still be snow in mid-June so not all the hikes will be available. But if enough people are going then the trails should be pretty darned easy to follow. I would bring “icers” and poles for sure. Camping could be chilly – but it could be quite alright too. It can literally snow at any time of the year so I would bring lots of layers. In July there will be far less snow and honestly it will make a huge difference. It’s a tough call when a reservation is so hard to get. The other thing you can do is try and get a last minute cancellation in July as that does happen frequently. How’s that for an on the fence answer. Personally I would wait till July UNLESS it’s a really warm May and you know the snow has been melting quickly. @Carrie I wouldn’t call it a must do. It does have more facilities than most (lockers, benches) and a great big fire ring but apart from the ease (which is something to consider) of starting a hike, it’s not going to make or break your trip. Traditionally June – at least in Alberta – is a very wet month just as an FYI. I have enjoyed reading your posting. Great articles and photos! You mentioned that your daughter hated saddle area. Is it because the heights, narrow and slippery? I am uncomfortable with heights (like Cliffs,edges) . should I skip this area? I will be there 2-3days from July 22. @Grace It’s not slippery but there is a section where you have to deal with heights. I work on a Circle of Fear that’s 10′ wide and I don’t look down when the going gets tough mentally. If you’re super scared of heights, give it a pass. But the views from this part of the hike sure are beautiful. @Grace I would say no BUT if you do the whole alpine route early in July they may still come in handy. The rest of the route should be clear. I skipped Angels Landing in Zion. I am going to try….., hopefully I’ll go through it this time. How narrow is it? <10' ? @Grace Actually not sure – one of the ones I’ve had a guest post but I’ve never done it myself. I so wish I had found this back when I started planning my huge Canada trip back in January! A bit late now (1 month out), but I’ll definitely try for a last minute cancellation spot to open up! @Ian This is truly some of the best mountain scenery in Canada. Just a caution about counting on a bus ride out after hiking in for the day. It is becoming more and more popular for people to hike the road up for the day and try to get a bus ride down. But the bus ride down is not guaranteed. Staff at LeRelais said the weekends were getting especially busy, often with more than 100 people walking in, past the capacity of the buses. Often there were tears when people were told the bus was full and they were going to have to hike the road back down. 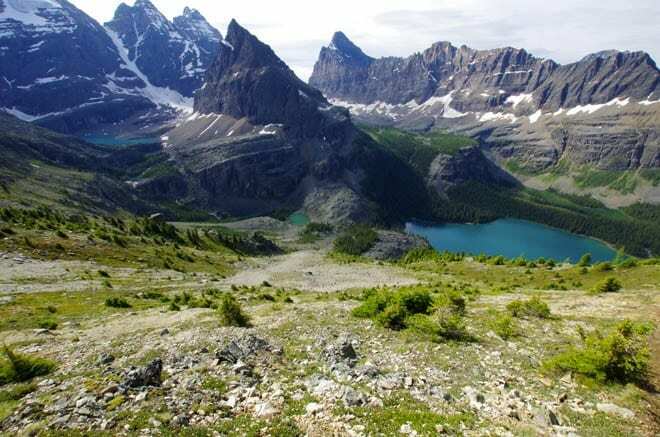 No doubt this is one of the great spots to hike in Canadian Rockies, but there are other great options that don’t necessitate a 22km walk through the trees to access. @Paul The Lake O’Hara hiking experience is so popular – and I hadn’t appreciated that getting a bus ride down was now such a huge issue. I agree that the Rockies offer a huge number of stellar hiking experiences without having to deal with 22 km of uninteresting, viewless walking in the trees. such incredible beauty…out of this world pics! on my bucket list for sure.